When you start stocking Fuller’s beers, you don’t just put premium products behind the bar – you introduce your customers to 170 years of brewing history and heritage. We’ve been brewing our famous ales by the Thames since 1845, and we’re now London’s last remaining independent family brewery. Survival of the fittest, you could say, and our status as the only brewery to win the CAMRA Beer of the Year award with three different brews certainly suggests that’s the case. One of those brews is London Pride - not just an award-winner, but also a real crowd pleaser. It’s the best-selling premium ale in the UK, increasing both in sales and market share year on year. It commands a premium price too - making it the top beer for influencing your bottom line. There’s more to Fuller’s than London Pride, though. 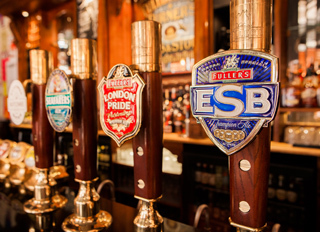 ESB and Chiswick Bitter are two of the other big award winners in a line-up of beers that range from refreshing pale ales to rich, dark porters. Organic Honeydew has earned an accolade too, as the UK’s best-selling organic beer. These premium ales are proven to sell well throughout the year – but all ale drinkers like to experiment, and that’s where our seasonal range comes in.